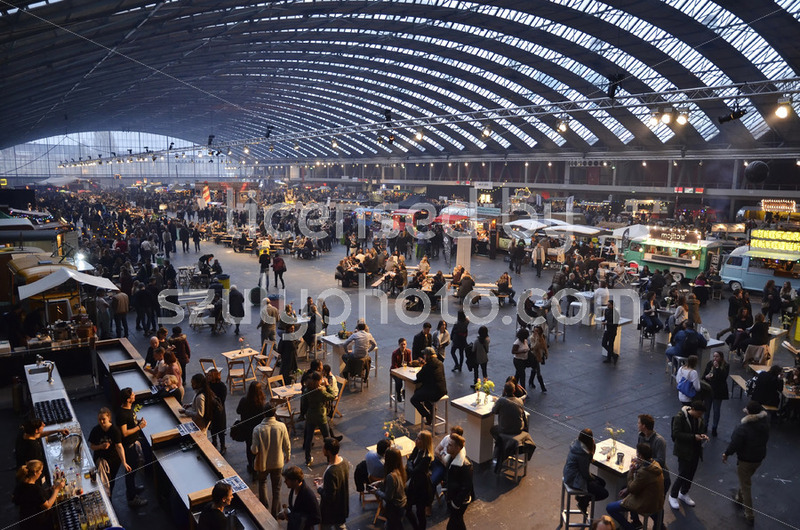 Amsterdam, Netherlands: Wide angle view of the front dining section of the food hall. 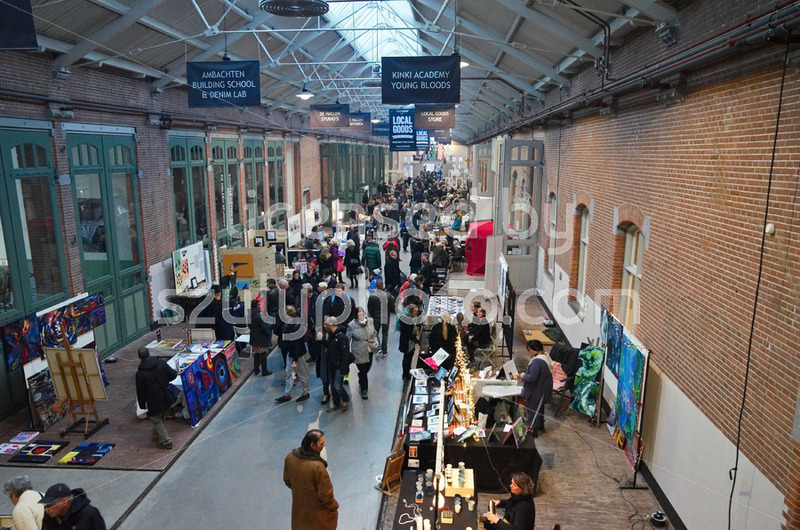 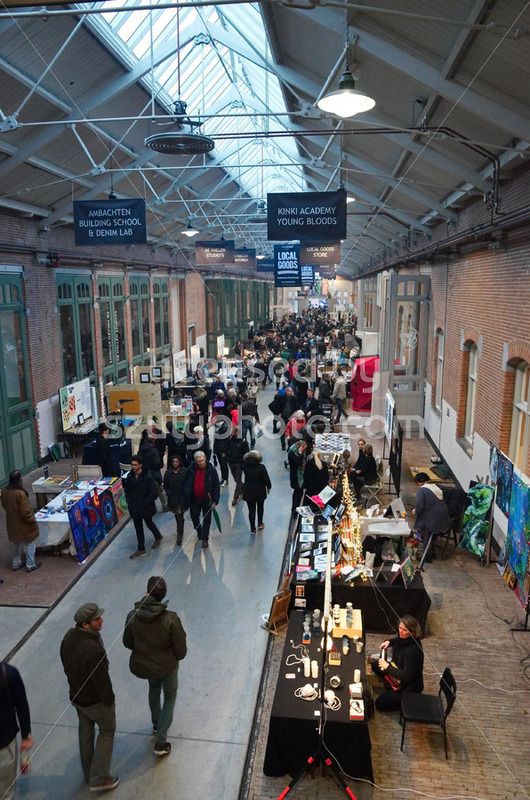 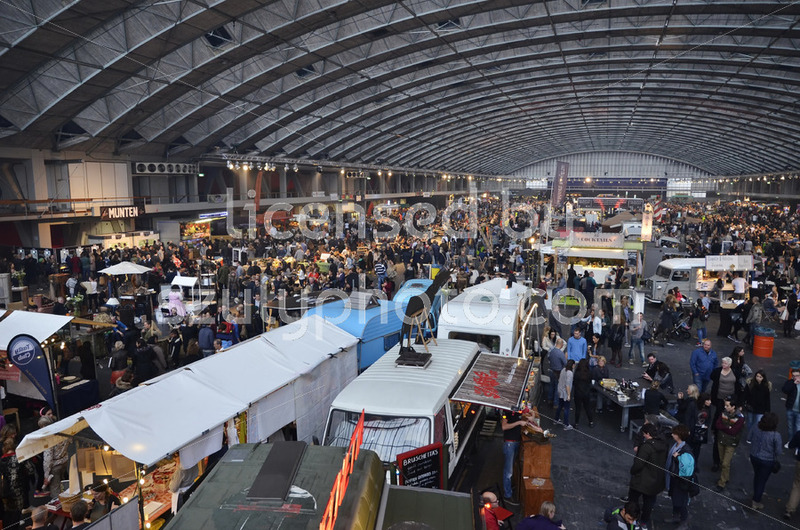 The street food facility is located in the De Hallen event hall on the Bellamyplein in the Kinkerbuurt. 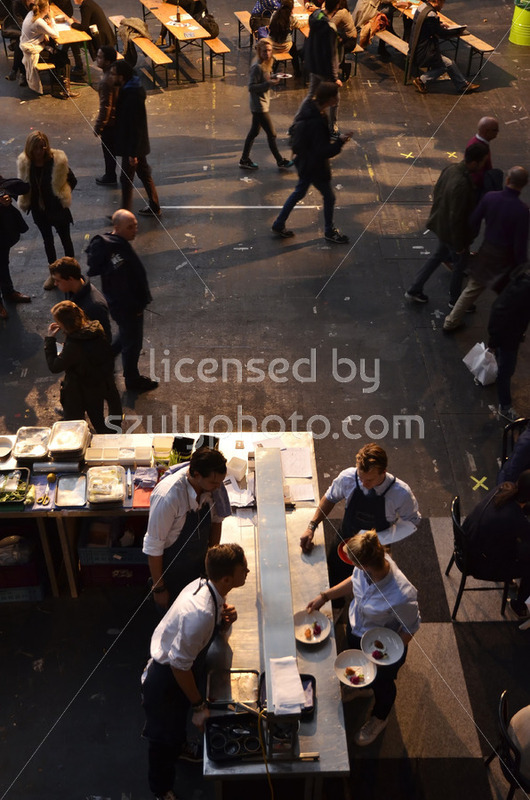 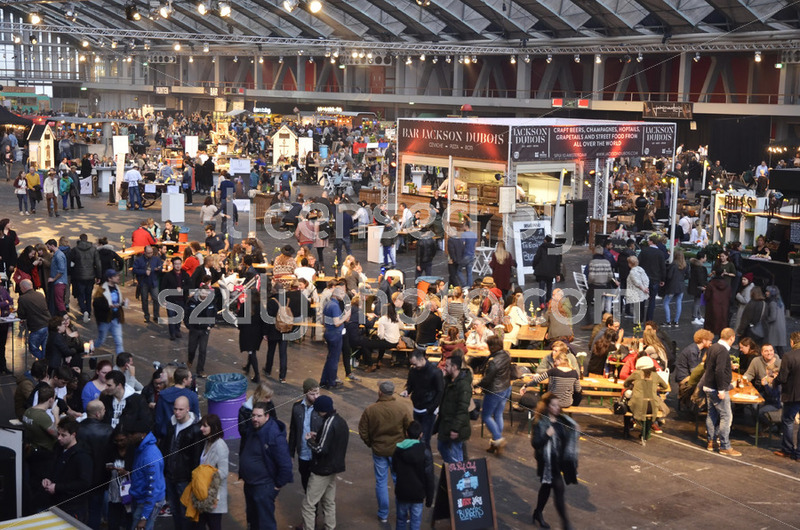 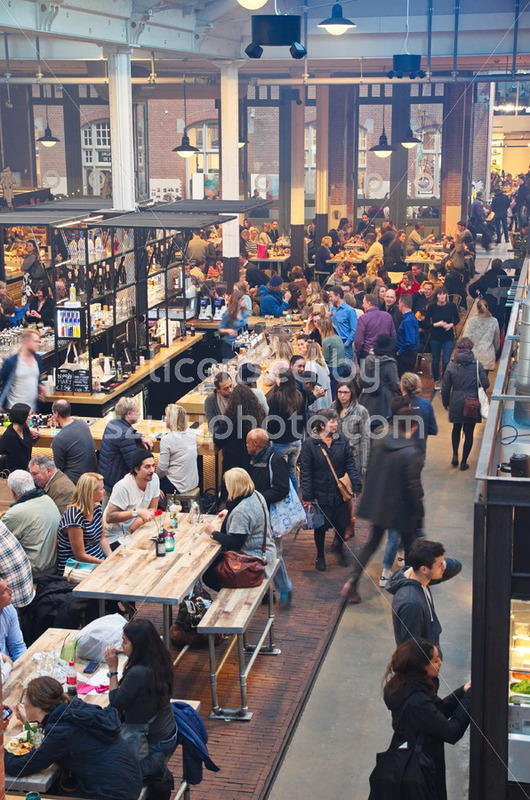 Amsterdam, Netherlands: View of the crowded tables at the De Hallen food hall. 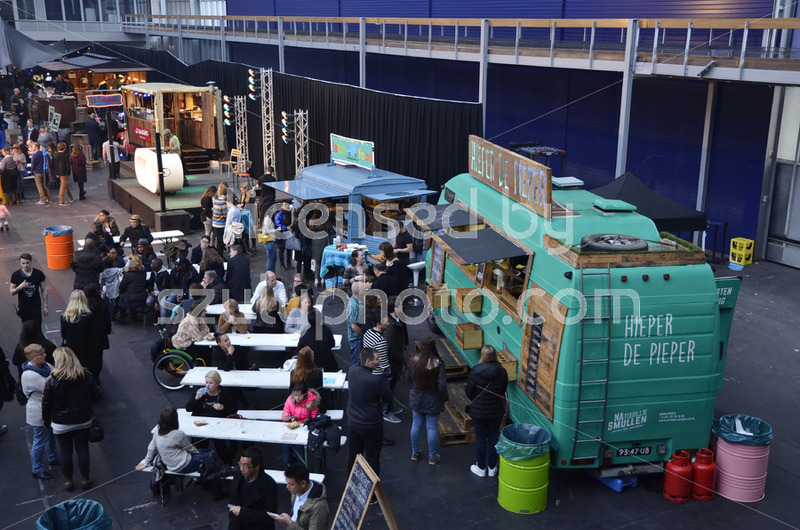 The street food facility is located on the Bellamyplein in the Kinkerbuurt. 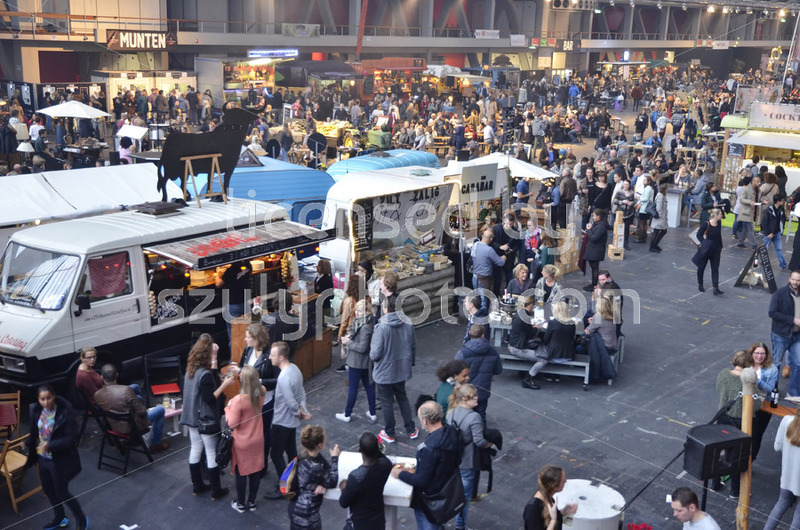 Amsterdam, Netherlands: View of the visitors at the Bulls and Dogs hot dog stand. 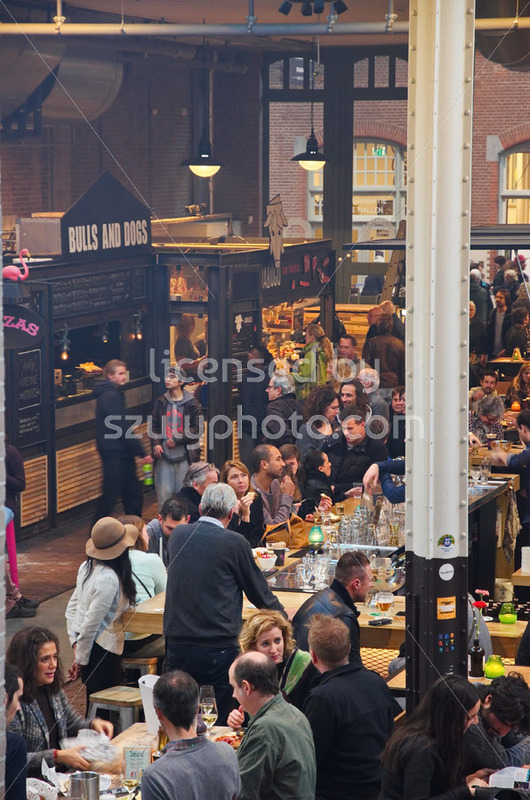 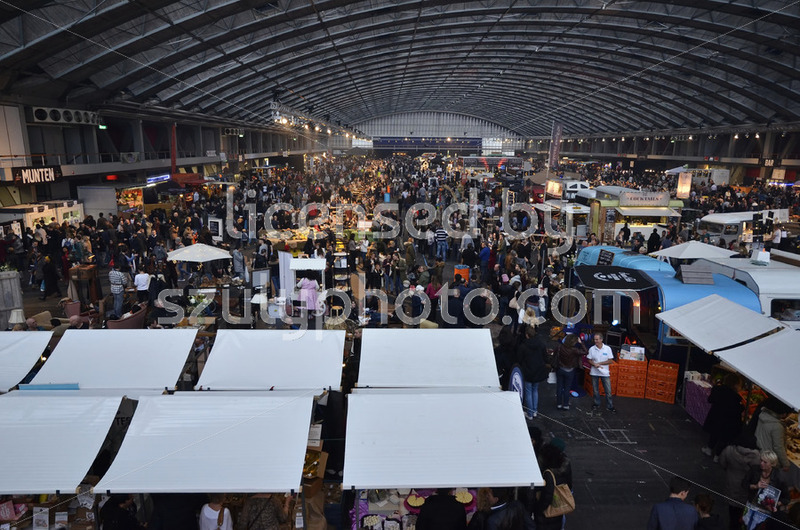 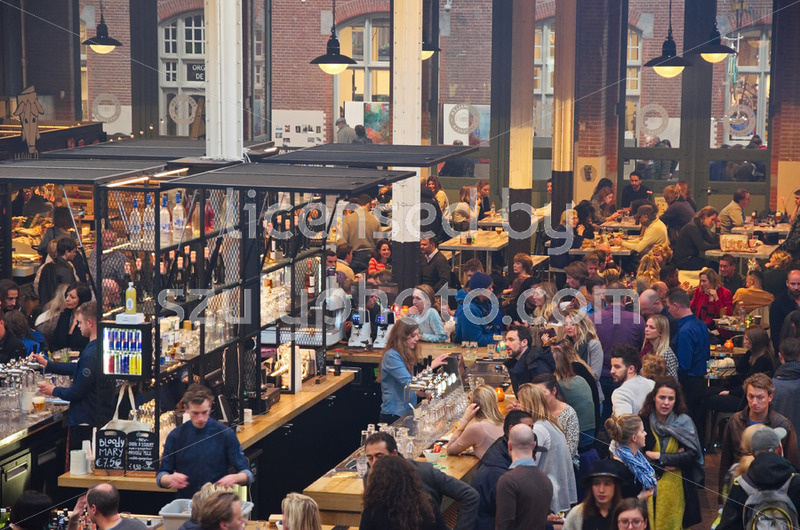 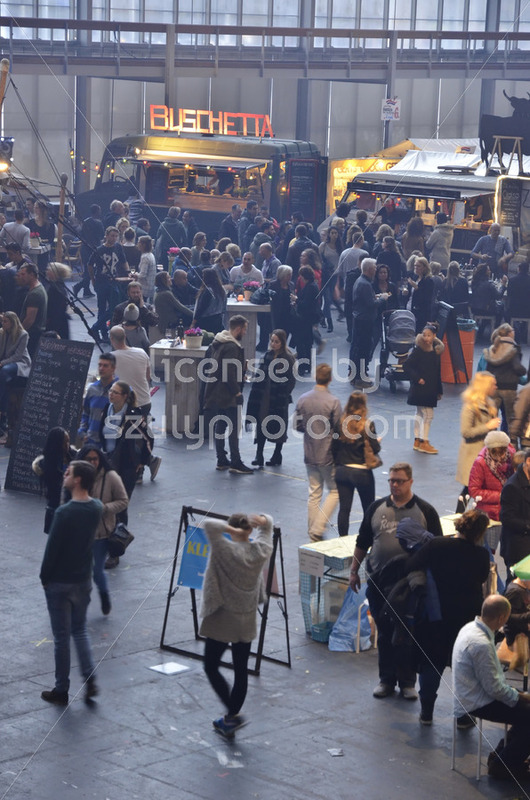 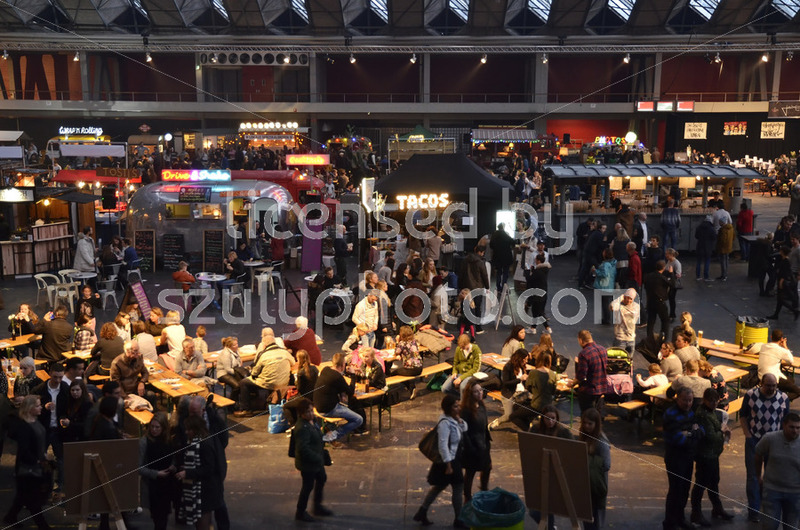 The food stall is located in the De Hallen street food hall on the Bellamyplein in the Kinkerbuurt..
Amsterdam, Netherlands: Zoom-in view of the crowd at the central bar, in the food hall at the De Hallen event hall on the Bellamyplein. 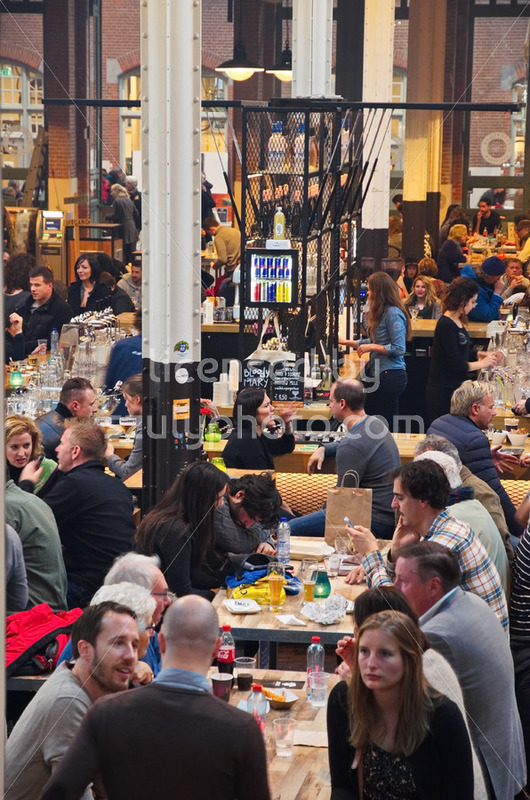 Amsterdam, Netherlands: Portrait view of the visitors in the food hall, at the central bar. 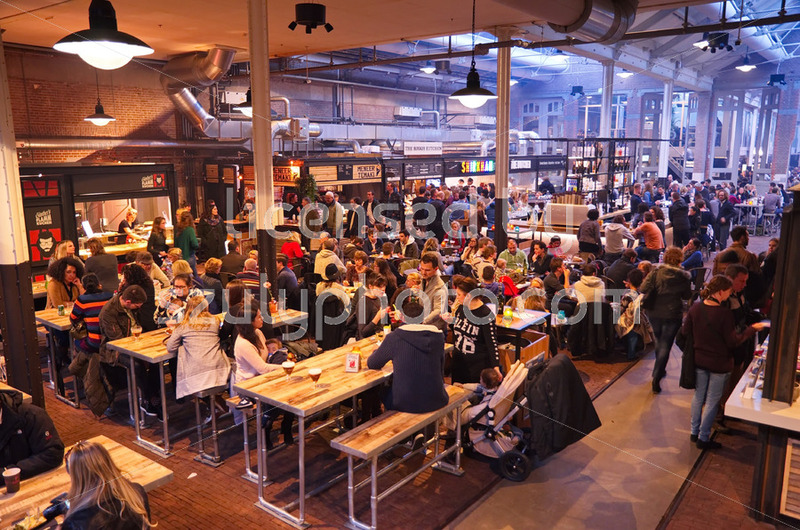 Visitors are dining inside the De Hallen event hall on the Bellamyplein in the Kinkerbuurt. 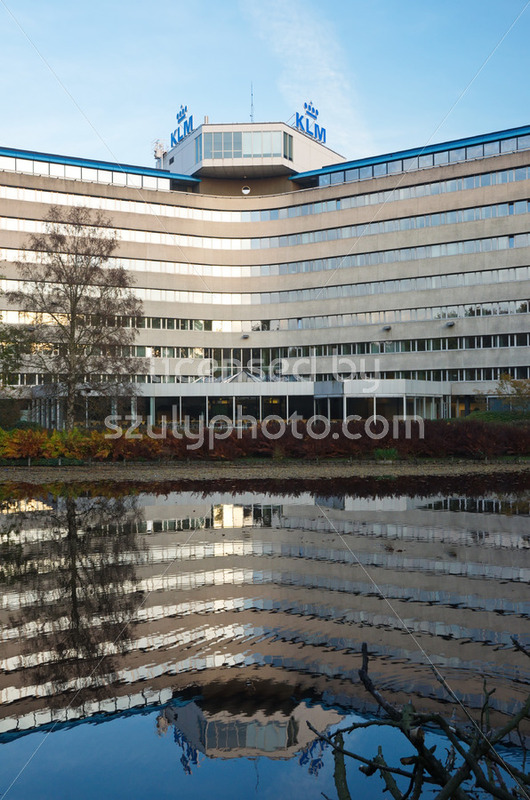 Amstelveen, Netherlands: Back view of the KLM Headquarters Building on the Amsterdamseweg, from the Amsterdam Forest (Amsterdamse Bos), with the image of the building reflecting on the water of the neighboring canal. 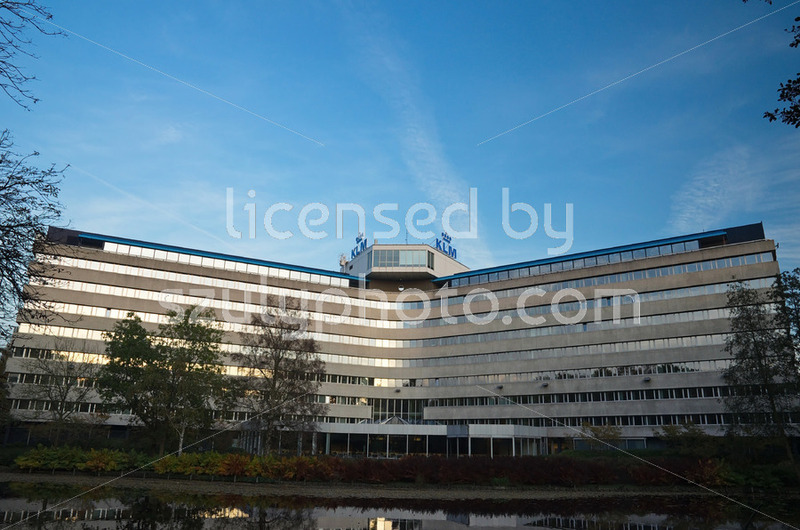 Amstelveen, Netherlands: View of the triangular KLM Headquarters Building on the Amsterdamseweg, from the Amsterdam Forest (Amsterdamse Bos), under the cloudy sky. 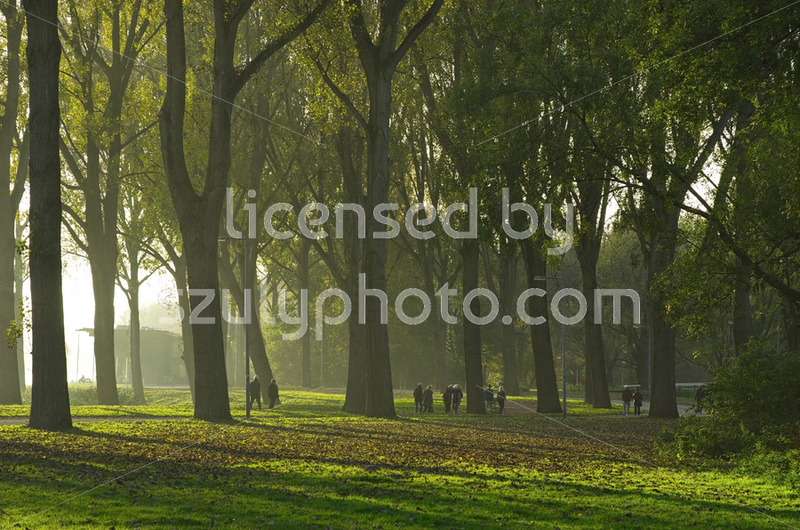 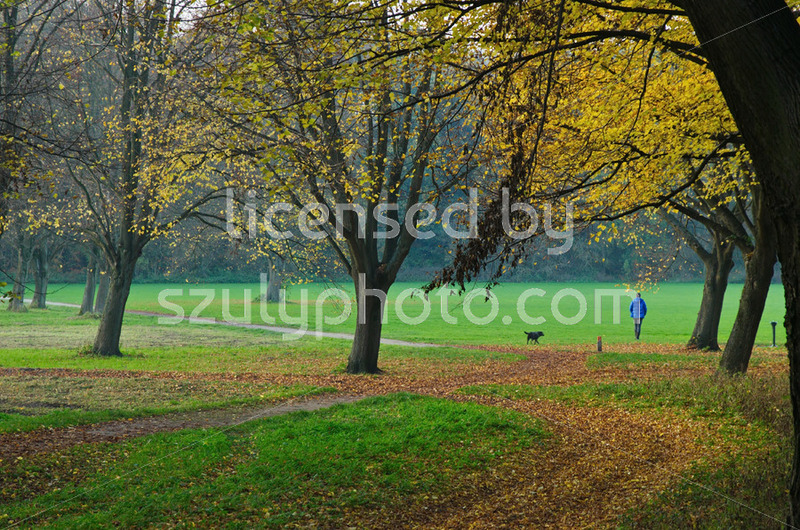 Amsterdam, Netherlands: View of a man from behind, walking a dog in the Amsterdam forest (Amsterdamse Bos), among the autumn trees and the walking paths covered in yellow fall leaves. 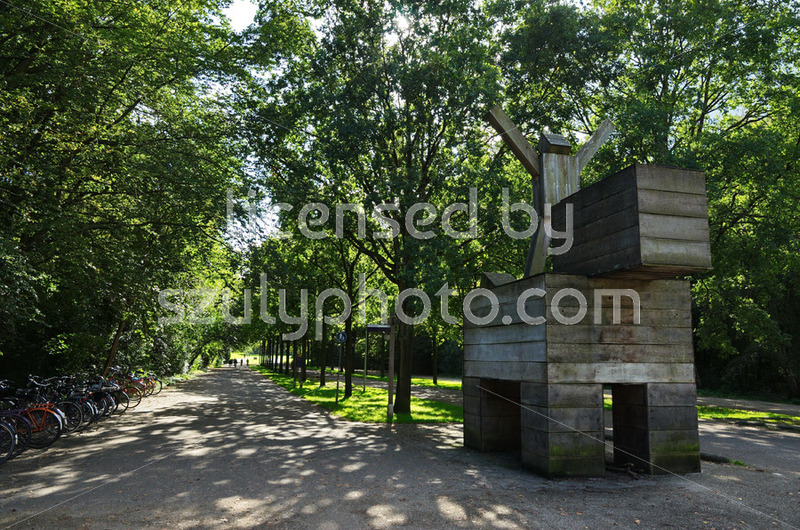 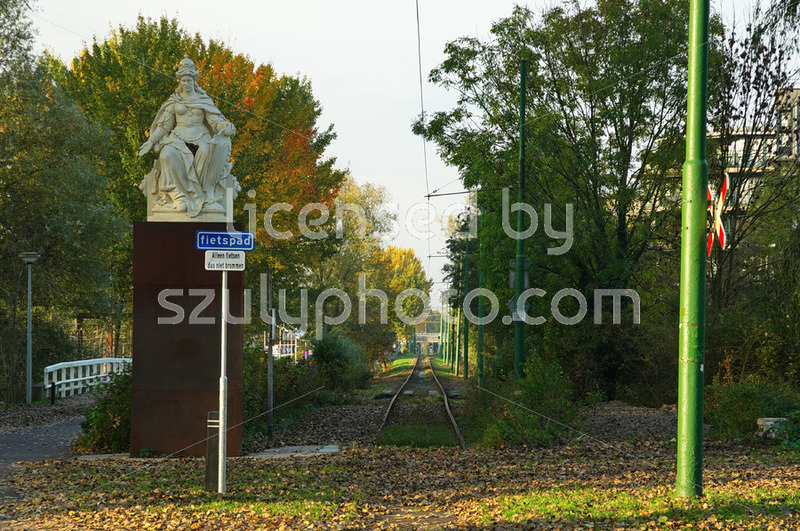 Amsterdam, Netherlands: Frontal view of the limestone sculpture of the maid of Amsterdam in a sitting pose in the Amsterdam forest (Amsterdamse Bos), next to the rail tracks towards Amstelveen. 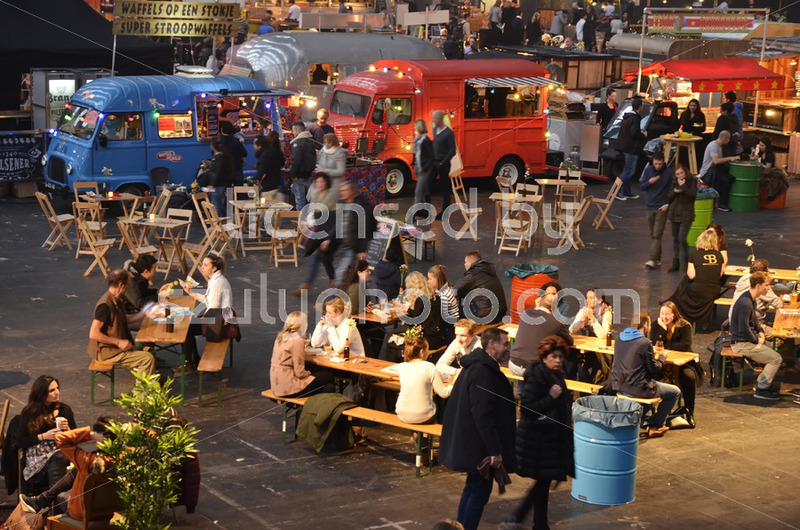 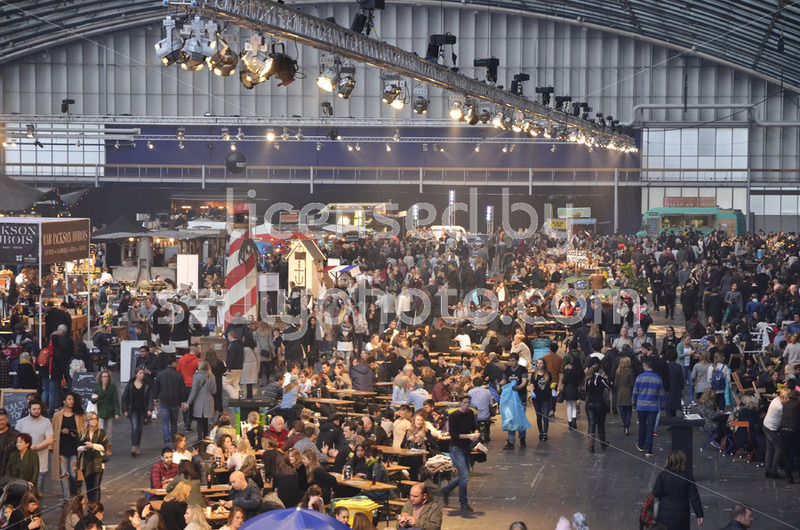 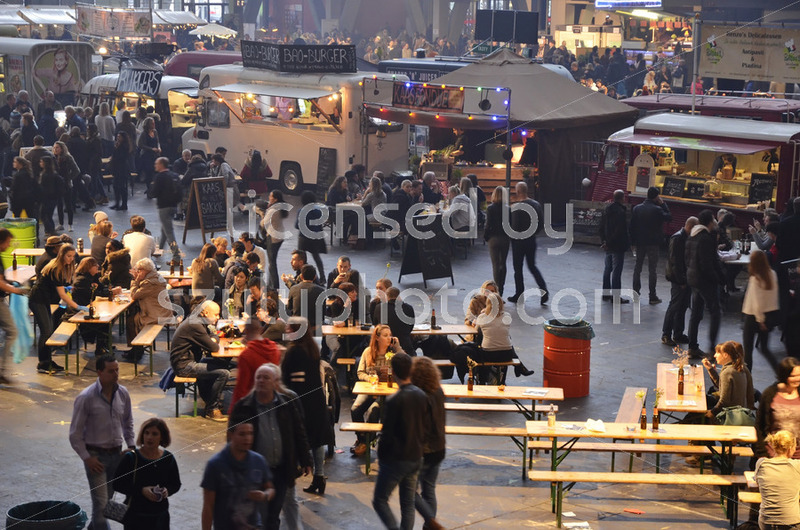 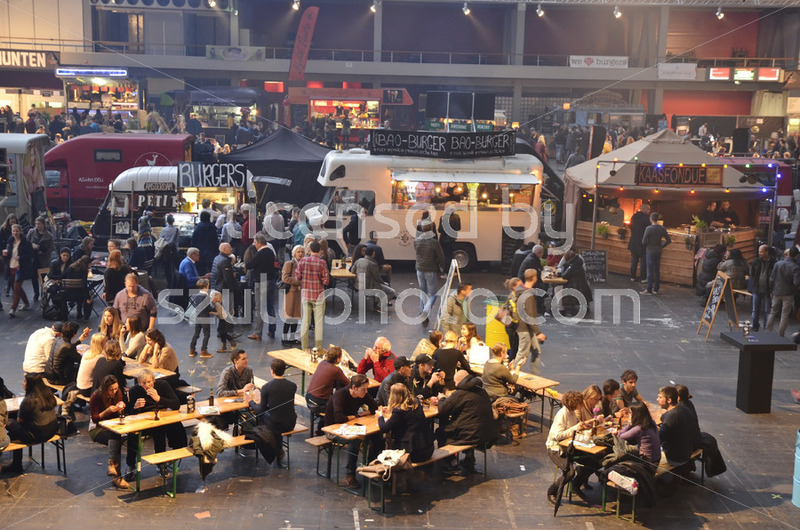 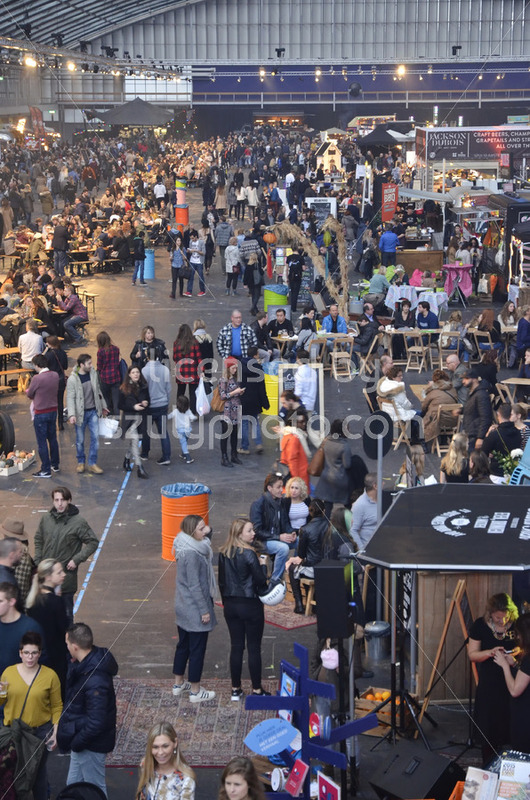 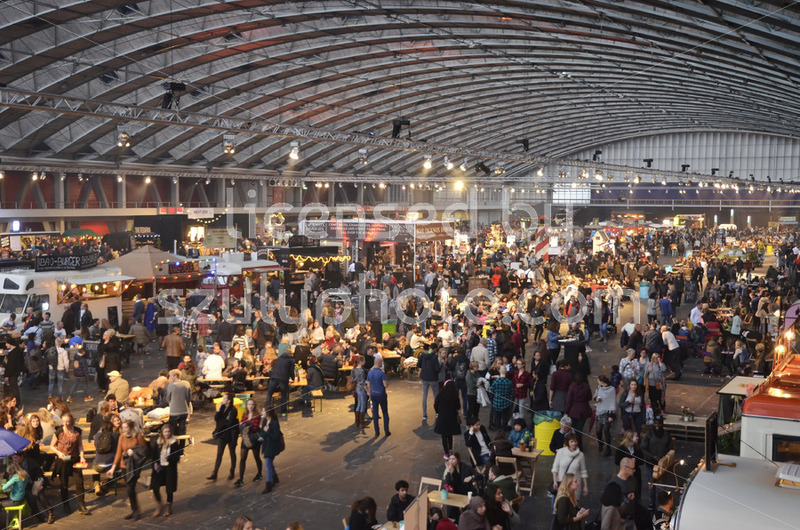 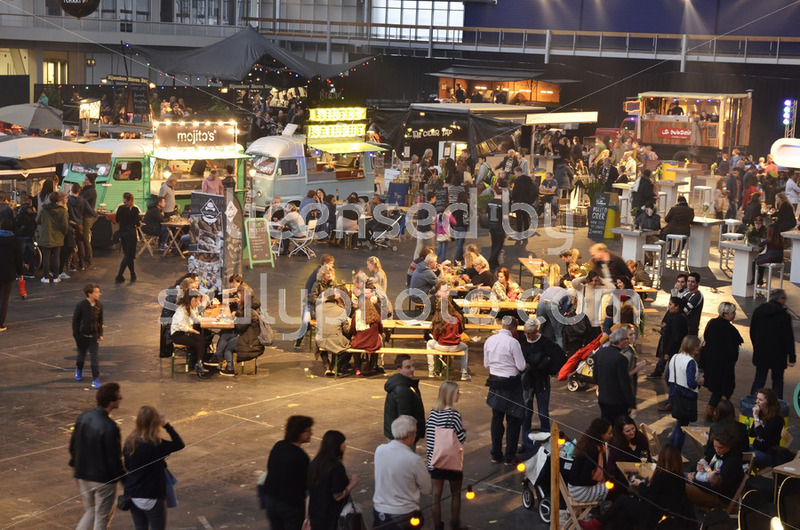 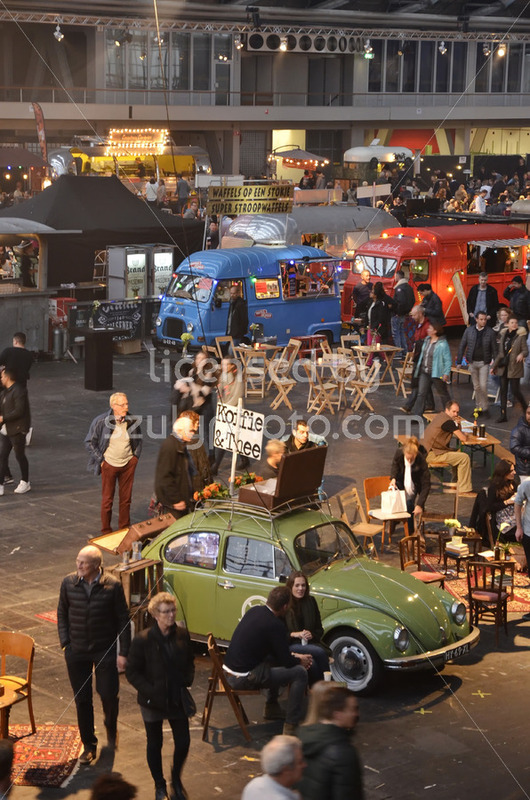 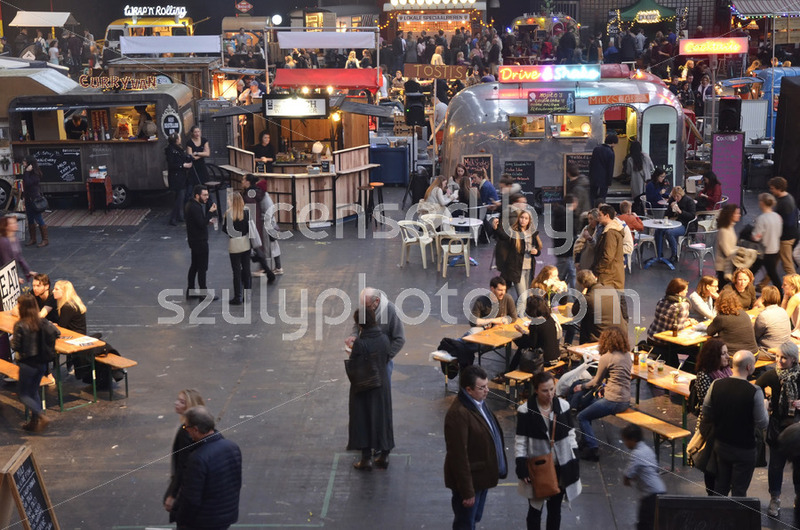 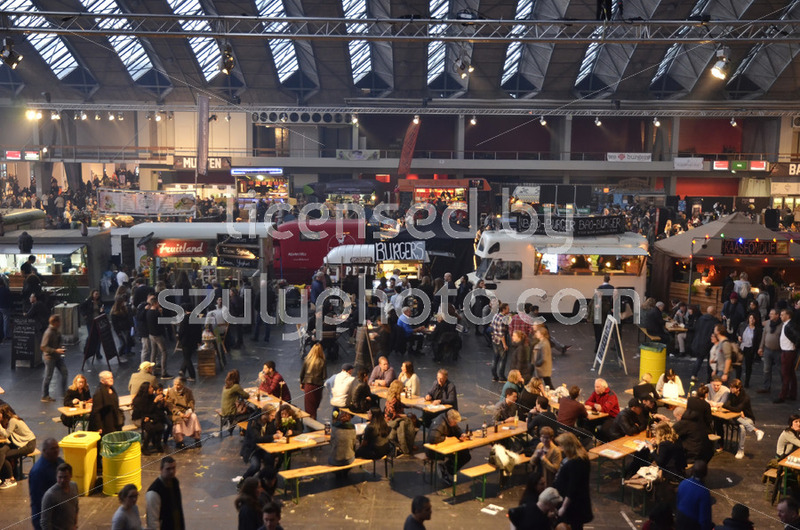 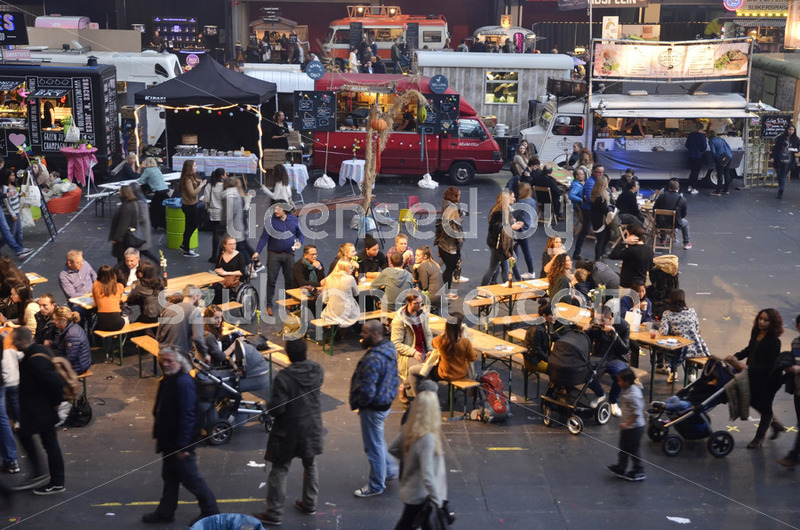 Amsterdam, the Netherlands – November 29, 2015: Visitors at the Hieper De Pieper and the Latin Food food truck in the crowd of the Europe Complex (Europahal) at the Foodfestival Amsterdam 2015 at the RAI. 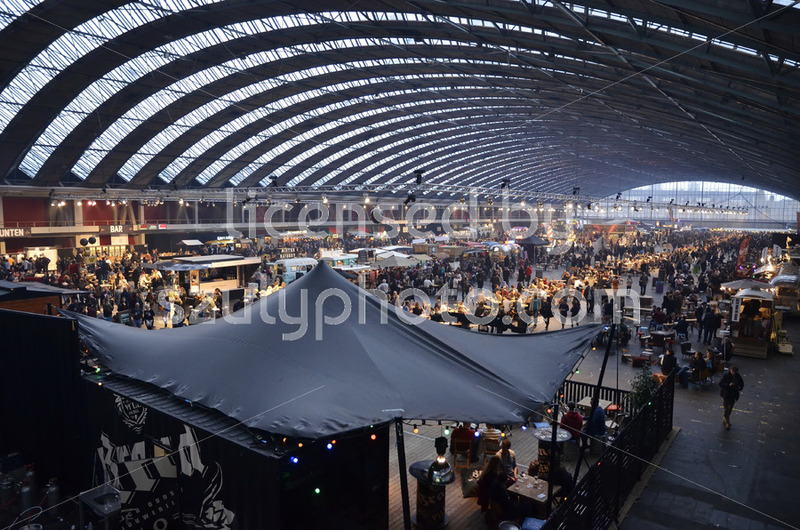 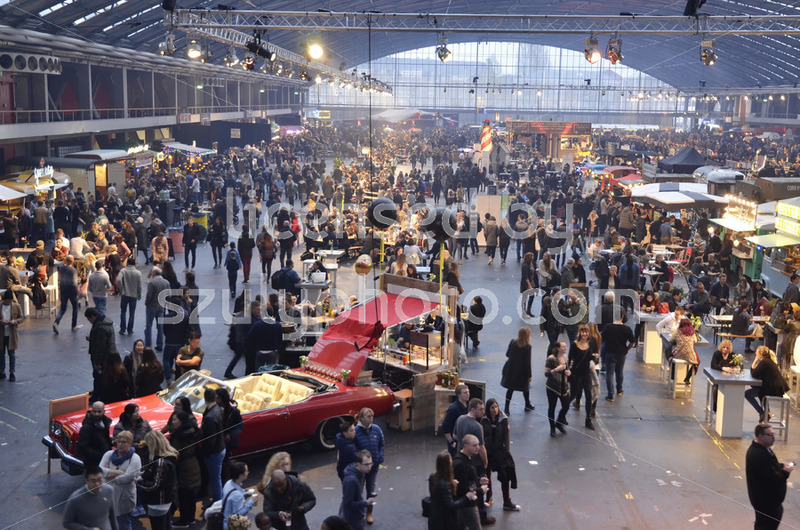 Amsterdam, the Netherlands – November 29, 2015: View from the top of the Brand Bijzondere Bierenbar, in the Europe Complex (Europahal) at the Foodfestival Amsterdam 2015 at the RAI. 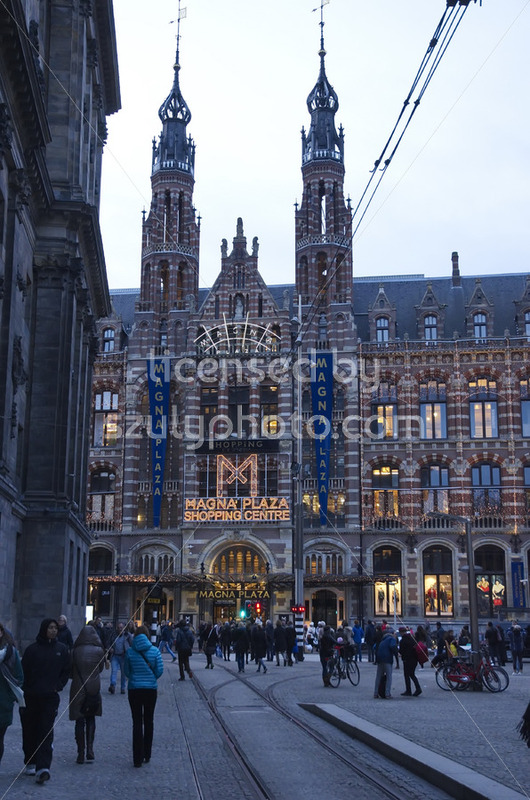 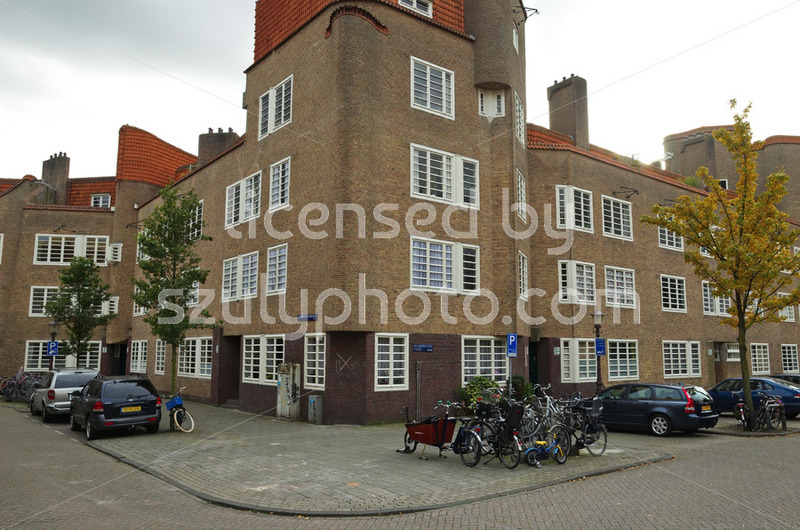 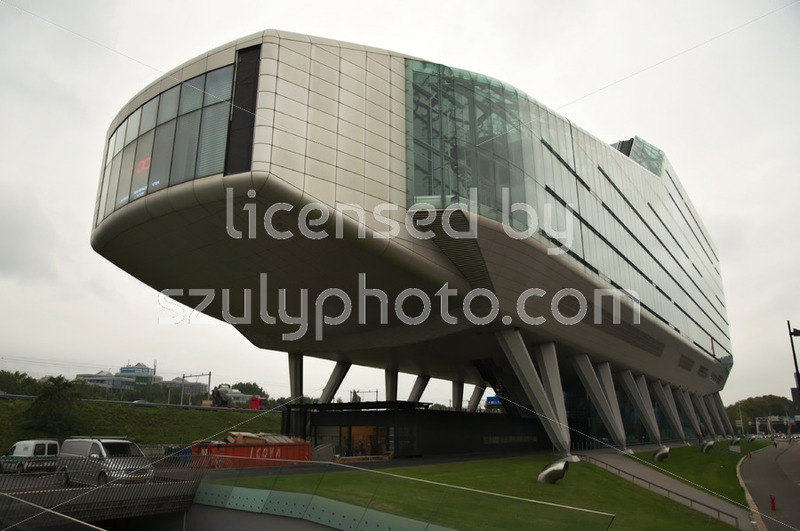 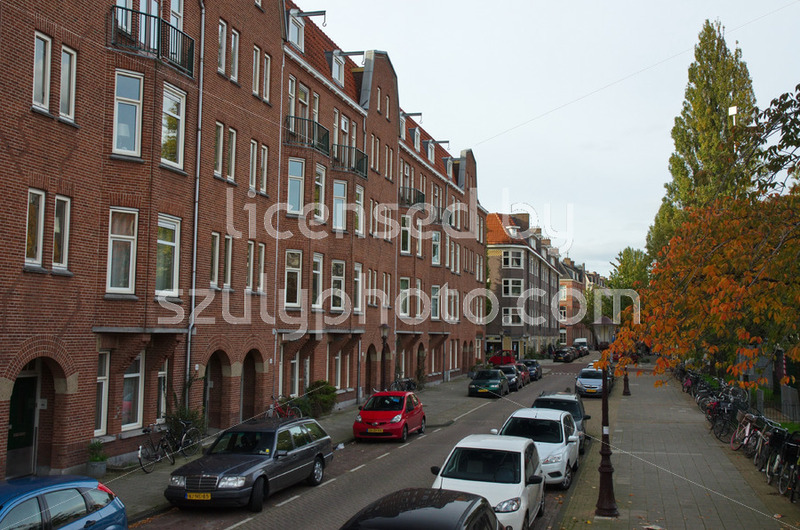 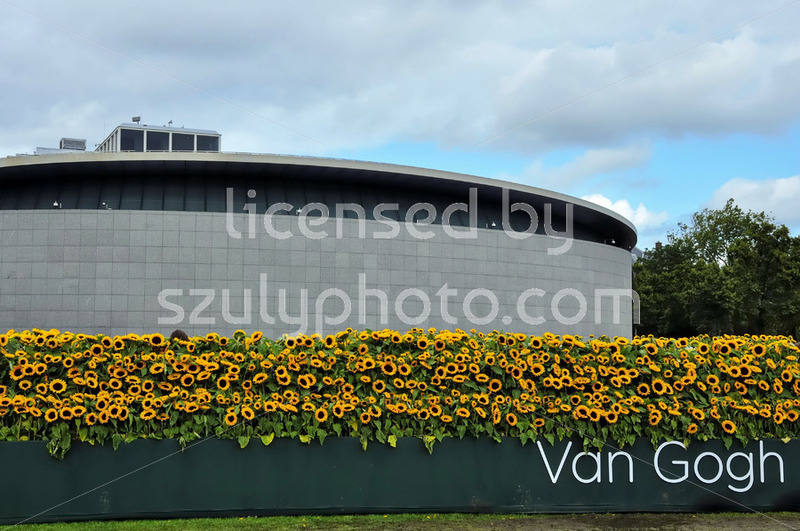 Amsterdam, the Netherlands – October 14, 2015: Street view of the ING House (Headquarters), currently an office building for various local businesses, designed by Meyer and Van Schooten, on the Amstelveenseweg.